Models Claire Coulter and Avis Newcomb wearing dresses by Lanvin and Chanel at 1200 Fifth Avenue, 1931. Don’t miss the recently published book Edward Steichen In High Fashion: The Condé Nast Years, 1923-1937, which discusses and re-publishes Steichen’s fashion photography and celebrity portraits. 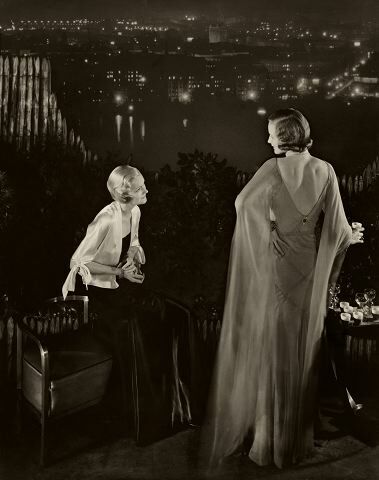 The images—all from the Condé Nast archives—were originally published in Vanity Fair and Vogue, and illustrate Steichen’s contribution to the burgeoning field of fashion photography and celebrity portraiture. That these two fields did not sit in high regard within the fine arts and photography realms with which Steichen had been previously associated, made his choice controversial and, to some extent, unusual. However, as Tobia Bezzola—one of the book’s authors—explains, his previous work as a painter and a fine art photographer clearly informed his “commercial” work—particularly in his rendition of clothing, as well as his choice of poses for his subjects. The lavishly illustrated book, published by W.W. Norton, developed as a result of research that curators William A. Ewing and Todd Brandow completed in the Condé Nast Archives for the exhibition “Edward Steichen: Lives in Photography.” Steichen in High Fashion undoubtedly benefits from their extensive knowledge of the photographer’s work, which allowed them to fully contextualize this aspect of Steichen’s output within the rest of his career. Among the most iconic portraits included are those of actress Gloria Swanson and Pola Negri, and, later, Greta Garbo and Anna May Wong alongside those of dancers as Martha Graham, as well as Winston Churchill and Walt Disney.